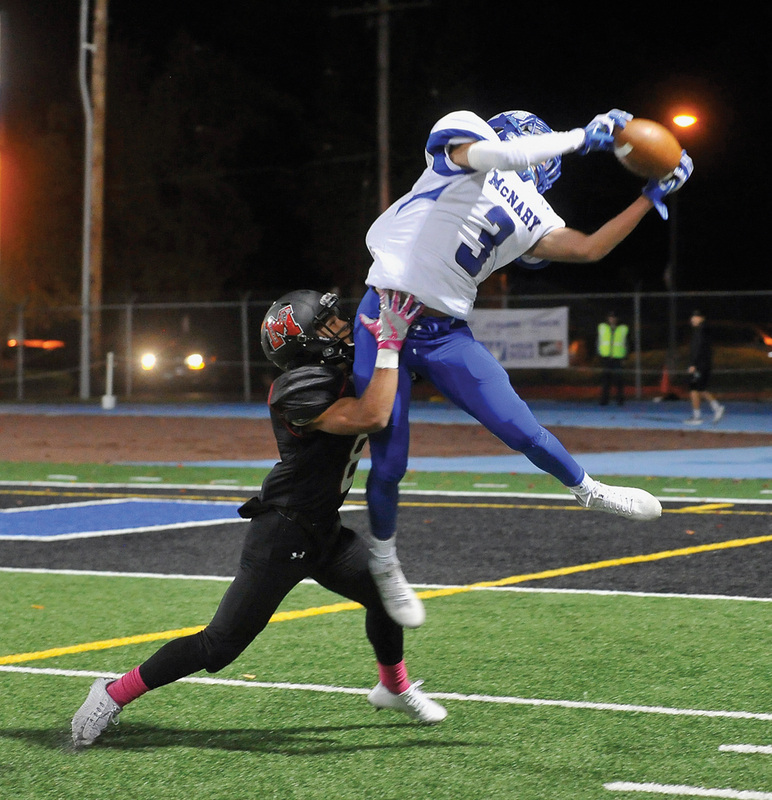 Determined to be more physical, McNary defeated North Medford 40-20 in a non-league football game on Friday, Oct. 20. The Celtics finished with more than 500 yards on offense—211 rushing and 301 passing. McNary jumped out to a 13-0 lead in the first quarter as quarterback Erik Barker threw touchdown passes to Jonny Williams and Jose Solorio. The Black Tornado stormed back with 75-yard and 1-yard touchdowns to take a 14-13 lead. But the Celtics quickly answered as Barker connected with Junior Walling for an 11-yard touchdown. McNary’s defense then gave the team a spark going into halftime as Walling recovered a fumble deep in North Medford territory and returned it for a touchdown to give the Celtics a 26-14 lead. The Black Tornado opened the second half running the ball inside McNary’s 10-yard line but the Celtic defense was able to hold on fourth down. McNary scored two more touchdowns in the third quarter on a pass from Barker to Williams and a run by Walling to bust the game open and take a commanding 40-13 lead. “We were thinking it was going to be a pretty close game but going down there and putting the work to them was a pretty good confidence booster,” Ebbs said. Solorio added an interception before North Medford scored the final touchdown of the night with 10:51 remaining. The Celtics were than able to run out the clock. Walling rushed for 102 yards on 18 carries and caught two passes for 25 yards. Robert Benson had 84 yards on 17 attempts. Barker completed 22 of 31 passes for 301 yards and four touchdowns. Jacob Jackson caught eight passes for 96 yards. Williams had three receptions for 97 yards.